Invoking the magic of MacBook’s Spotlight is a snap. 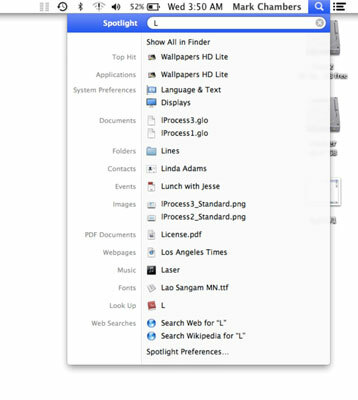 The Spotlight search field always hangs out on the right side of the Finder menu bar. You can either click once on the magnifying glass icon or just press cmd+spacebar. 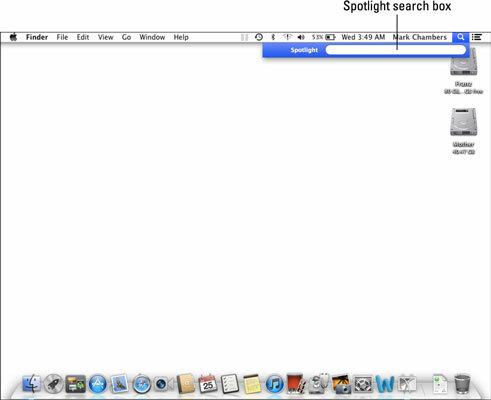 Either way, Mountain Lion displays the Spotlight search box. Spotlight works by indexing — in other words, searching for and keeping track of keywords in your files. In fact, Mountain Lion indexes virtually all the contents of your MacBook’s drives, maintaining that humongous index continuously while you create new files and modify existing files. 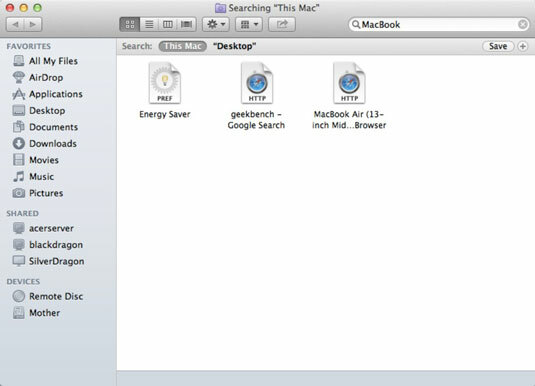 Mountain Lion can search this index file in a fraction of a second after you enter your search criteria. Your index file contains all sorts of data, hence Spotlight’s capability to present matching data from your files and application records. To begin a Spotlight topic search, click within the Spotlight box and start typing. As soon as your finger presses the first key, matching items start to appear. You don’t need to press Return to start the process, by the way. When you type more characters, Spotlight’s results are updated in real time to reflect those more restrictive qualifiers. For example, if you type three characters — say, Lio — your results would be far more specific: everything from Mountain Lion to Lionel Trains. Spotlight displays what it considers the top 20 matching items in the Spotlight menu itself. These most relevant hits are arranged into categories, such as Documents, Images, and Folders. You can change the order in which categories appear. With its internal magic, Spotlight presents the category Top Hit at the top of the search results. You’ll find that the Top Hit is often just what you’re looking for. To open or launch the Top Hit item from the keyboard, just press Return. Didn’t find what you were after? Click the X button that appears at the right side of the Spotlight box to reset the search box, and then start over. If all you know about the item you’re searching for is its file type, you can display all the files of a particular type on your system by using the file type as the keyword. For example, to provide a list of all images on your system, just use images as your keyword — the same goes for movies, contacts, applications and audio, too. After you run a search and Spotlight finds the proverbial needle in your system’s haystack, what’s next? To see all sorts of useful info about each Spotlight menu item, click the Show All item to expand your Spotlight menu into the Results window. From the keyboard, you can press the Results window shortcut key, which you can set from System Preferences. To further filter the search, click one of the buttons on the Spotlight Results window toolbar or create your own custom filter. Click the button with the plus sign to display the search criteria bar, and then click the pop-up menus to choose from criteria, such as the type of file, the text content, or the location on your system. You can also filter your results listing by the date when the items were created or last saved. To add or delete criteria, click the plus button or minus button, respectively, at the right side of the search criteria bar. To save a custom filter that you created, click Save. After you locate the item you want, click it to open, launch, or display it, just like you would on the Spotlight menu. The System Preferences window boasts a Spotlight pane, which you can use to customize what search matches you see and how they are presented. To adjust these settings, click the System Preferences icon in the Dock and then click the Spotlight icon. Choose your categories. To disable a category, select the check box next to the unnecessary category to clear it — thereby making more room for other categories that you will use. Specify the order in which categories appear in Spotlight. Drag the categories into the order in which you want them to appear on the Spotlight menu and in the Results window. 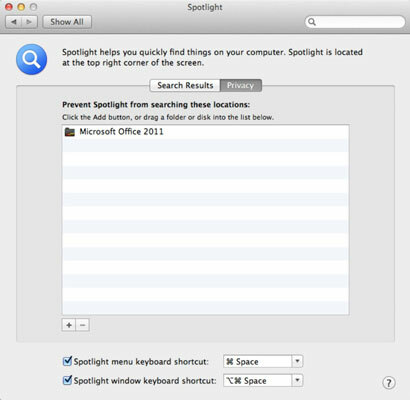 Select new Spotlight menu and Spotlight Results window keyboard shortcuts. In fact, you can enable or disable either keyboard shortcut, as you like. Click the pop-up menu to choose a key combination. 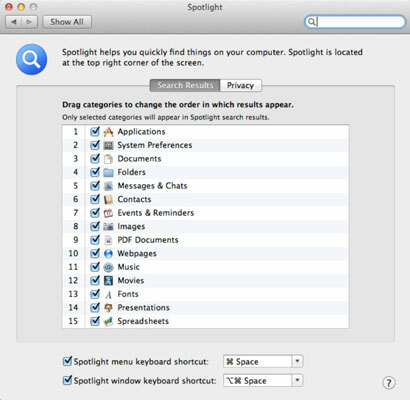 Click the Privacy tab to add disks and folders that should never be listed as results in a Spotlight search. The disks and folders that you add to this list won’t appear even if they match your search string, no matter what type of search you use. This safeguard can come in handy for organizations that are required by law to protect their patient or client data. To add a private location, click the Add button and navigate to the desired location. Then click the location to select it, and click Choose.